Home NY Times U.S. Spent $8 Billion on Afghanistan’s Air Force. It’s Still Struggling. U.S. Spent $8 Billion on Afghanistan’s Air Force. It’s Still Struggling. MOGHKHAIL, Afghanistan — The A-29 attack plane was a white speck in the bright skies over eastern Afghanistan as it launched a dummy bomb that exploded just yards from the target, a wrecked truck. “Spot on!” said an American adviser watching the exercise. The plane’s Afghan pilot had been guided by an Afghan coordinator on the ground — but only after previous bombing runs had struck well wide of the truck. Eleven years after the United States began building an air force for Afghanistan at a cost now nearing $ 8 billion, it remains a frustrating work in progress, with no end in sight. Some aviation experts say the Afghans will rely on American maintenance and other support for years. Such dependence could complicate President Trump’s moves to extricate the United States from the 17-year-old war against Taliban insurgents — a war in which they lately appear to be gaining ground. For years beginning with the Obama administration, part of the American exit strategy has been to build and train the Afghan military — including the air force — to fight the insurgents on its own. That strategy appeared to be undermined in December when Mr. Trump was said to have ordered preparations for half the 14,000 American troops in Afghanistan to come home. At the same time, American military officials have been warning that the Afghans remain dangerously unprepared. “If we left precipitously right now, I do not believe they would be able to successfully defend their country,” Marine Lt. Gen. Kenneth McKenzie Jr., nominated to lead the United States Central Command, told Congress last month. Today, American-led coalition aircraft carry out roughly five times as many airstrike missions as the Afghan Air Force — more than 6,500 last year alone. When insurgents overrun outposts or districts, it typically takes American warplanes and American-trained commando units to drive them back. Airstrikes from Afghan aircraft have killed civilians at a disproportionately higher rate than American ones. “The Afghan Air Force, while it is improving, has not in any sense offset the need for more and more U.S. air presence, and that’s a little discouraging,” said Anthony H. Cordesman, a security analyst with the Center for Strategic and International Studies in Washington. “There is no plan to create an Afghan Air Force as yet that could replace the role of the U.S. air component,” he said. By any measure, the Afghan Air Force is far more capable than the deteriorating, 20-aircraft force of 2007. About 265 American-trained Afghan pilots now fly 118 aircraft supplied by the United States, American trainers said. The fleet is projected to double by 2023. A separate Special Mission Wing flies special operations missions. Last month, Afghan pilots flew their first night attack missions. In June, they conducted their first combat airdrop. In March, the air force fired its first laser-guided bomb in combat, with 600 more fired since. Afghan aircraft now regularly ferry troops and supplies and provide close air support. They also help evacuate casualties. But in interviews, United States Air Force commanders declined to predict when Afghans would fly with only minimal American support. They cited the unpredictability of building a modern air force in an undeveloped country consumed by war. A report last year by the Defense Department’s inspector general, while citing improvements, said American commanders could not effectively track Afghan progress because “they have not defined the intended end state” of the air program. One goal is to reduce reliance on American-led airstrikes. But those airstrikes rose by roughly 40 percent last year to help counter a Taliban offensive that some Afghan officials estimated had inflicted more than 30 deaths a day on Afghan forces in recent months. When Taliban fighters overran much of the city of Ghazni in August, it took American-led coalition warplanes and American-trained Afghan commando units to reclaim the strategic city, with support from Afghan aircraft. Maj. Gen. Barre R. Seguin, a senior United States Air Force commander in Afghanistan, said the number of Afghan airstrikes would grow as the American government supplied more aircraft. Lt. Col. Koné Faulkner, a Pentagon spokesman, said the Afghan share of overall strikes had increased in the past two years. But Afghan ground commanders complain that calls for Afghan air support often go unheeded. In August, an Afghan military base in the northern province of Faryab was overrun by Taliban fighters after commanders had begged in vain for air support and helicopter resupply. Lt. Gen. Mohammad Shoaib, the Afghan Air Force commander, said the force was not yet big enough to cover the entire country in the face of persistent Taliban attacks. Discussing a recent mission failure, he cited the time needed to plan missions and identify targets, as well as delays caused by bad weather, difficult terrain, communications problems and concerns about civilian casualties. American trainers have built an Afghan Army that relies heavily on air power that the air force might not be able to provide for years, said John F. Sopko, the special inspector general for Afghan reconstruction. “The Afghan Air Force doesn’t have the assets and capabilities yet to meet all operational requirements nationwide,” he said. Another concern is civilian casualties. In July, the United Nations said the Afghan Air Force had been responsible for 52 percent of civilian casualties caused by airstrikes in the first half of 2018, despite having conducted far fewer strikes than coalition aircraft. The United Nations also said insurgents had been responsible for two-thirds of all civilian casualties. General Shoaib and General Carey said American and Afghan aircrews followed strict procedures to limit civilian casualties, with pilots often pulling away from confirmed enemy targets for fear of hitting civilians. But Patricia Gossman, a senior Afghanistan researcher for Human Rights Watch, said the Afghan and United States militaries did not always conduct adequate civilian casualty investigations, making it difficult to correct mistakes. Some decisions on aircraft choices also have been faulted. Aviation experts have criticized a decision to phase out the old workhorses of the Afghan forces — Russian-made Mi-17 helicopters — for American-made UH-60 Black Hawks. Mr. Michel, the retired general, said the Mi-17 was “the perfect helicopter” for Afghanistan because it can carry more troops and supplies than the Black Hawk and is less complicated to fly. American commanders said obtaining spare parts for the aging, Russian-made copters was difficult. Of the 47 Mi-17s assigned to the Afghans, only 20 are operational. Mi-17s flew half the fleet’s 28,000 sorties last year, but the first Black Hawk did not fly until May. The plan to provide 81 Black Hawks will not be complete until 2030, Mr. Sopko said. Maj. Salim Faqiri, who has flown both aircraft, said that the Russian helicopter was more powerful but that the Black Hawk was more maneuverable and performed better in dusty landing zones. The United States has supplied Afghanistan with three types each of helicopters and propeller planes. Afghans have been trained to maintain and repair aircraft, and to assemble and load munitions. In many cases, Afghans are now training fellow Afghans. But even as the training mission shows progress, it has been dogged with problems. In 2013, the Pentagon abandoned a $ 486 million fleet of 20 G-222 medium-lift cargo planes provided to the Afghans, selling 16 planes for scrap metal at 6 cents a pound. Last spring, the Pentagon said that more than 150 Afghans sent to the United States for training — including air trainees — had gone absent without leave. 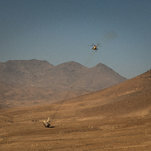 At least eight Afghan military helicopters crashed last year, according to a tally by The New York Times. Asked about Taliban claims that the choppers were shot down, General Carey said the crashes were under investigation. Although Afghan and American commanders say they have tried to crack down on corruption, the use of air force aircraft as personal taxis by Afghan political bigwigs remains a problem. American commanders say theft of aviation fuel delivered by Afghan contractors is another. General Shoaib predicted that the air force would be self-sufficient — except for maintenance — in three or four years. Some military analysts are less optimistic. Bill Roggio, who edits the Long War Journal, said the Afghan Army would not need an air force if it could take and hold ground. Since 2017, Taliban insurgents have held more Afghan territory than at any time since the American invasion in 2001. Tags: Afghanistan’s, Billion, force, It’s, spent, still, struggling, U.S.